El Presidente Chávez may not even squeak by this time. A post today by Daniel at Venezuela News and Views suggests that el Presidente Chávez may not win the electoral vote on October 7th. That does not mean that he won’t cling to power, but it is encouraging. Please read the article. It’s good. Here are a few excerpts. Daniel wrote about Chávez’ speech in Monagas. [I]t was the state where he was the most voted in 2006, I think, but after the major PDVSA oil spill over in Maturin’s drinking water and the clumsy attempt at the regime to hide the ecological crime and force people to drink it anyway, he all but lost the state. That is, it might still be chavista enough for him to squeak a 1% victory but with the governor running against him now, and a lot of the local pols that know better, Chavez chances are dim. That is, not only Chavez recognizes that his government has not been very good, but he asks people to vote for him for the sake of it. A little bit as if Carter had asked the US to vote for him because next rescue operation in Iran would turn out differently. 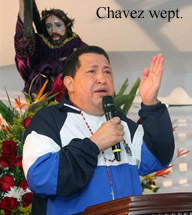 Chavez knows he is lost. Perhaps the Venezuelan voters will also realize that Chávez is terrible, has lost and will vote against him. This entry was posted in Begging, Chavez, Democracy, Elections, Hispanic, Opinion, Politics, Regime change, Shortages, Socialism, Venezuela and tagged politics, venezuela news and views. Bookmark the permalink. 7 Responses to El Presidente Chávez may not even squeak by this time. Sounds to me like Hugo is taking advice from the Obama re-election team. In regard to it getting ugly there… Socialism always gets ugly. It’s truly unfortunate for those that never supported him in the first place and don’t have the means to leave. Incompetent they are. But, they have showm during the attemted Coup led ny El Thugo that they are capable of killing. The military today is highly involved at the upper levels drug trafficing. They may fight to protect their interests. Having said that, over the years i have heard many times that everyone should stay inside because the military was going to do “something”.. The “something” never happened. I hope it will be that way this time as well. Dan, I talked to two peoplle tday that have contacts in the military. they each told me the same thing. they said the military is split about 50/50. That is not heakthy. If they were all for Hugo, it would mean not much chance of violence. If these people are right, things could get very ugly here. My only experience with the Venezuelan military was back in 2000, when we had the Venezuelan Navy do some work on our sailboat at the Base Naval in Puerto Cabello. We were stuck there for many months. The people were very friendly and generally as obliging as possible, but I was impressed with their incompetence. The Capitan de Fragata (roughly the equivalent in rank of a U.S. Navy Commander) who was in charge of our work had not the foggiest notion of what to do or how to do it. Behind his back, he was often disrespected by the men working under him, on whom he tried to place the blame for everything that went wrong. He was eventually discharged from the Venezuelan Navy. Later, we had to have nearly everything done in Venezuela ripped out and redone in Cartagena. That’s a miniscule sample, of course. Still, I wonder whether military competence has improved with more years of el Thugo. Back then, what I saw reminded me of the Russian military when WWI broke out, as written about in Barbara Tuchman’s Guns of August.